Dangerous working conditions and occupational hazards are not just present in labor-intensive industries anymore. Strangely enough, even when an employee is just sitting on a chair while doing work, there are certain dangers he or she might face. Technological advancements brought computers into the workplace. It made tasks easier to accomplish, and perhaps caused a dramatic shift in how office workers do their everyday job. However, it brought along inherent risks to office workers’ health and well-being, as they would hardly stand up, do repetitive actions, or forget about proper working posture. This norm has made ergonomics, or the study of people in a working environment, an important aspect when modeling office spaces today. Good office ergonomics means designing the environment for the people who will work in it to avoid discomfort and prevent injury. Three stressors can be prevented when you create an ergonomic environment for your workers: (1) the force required to do the job, (2) awkward or static working postures adopted because of it, and (3) repetitiveness of the task. 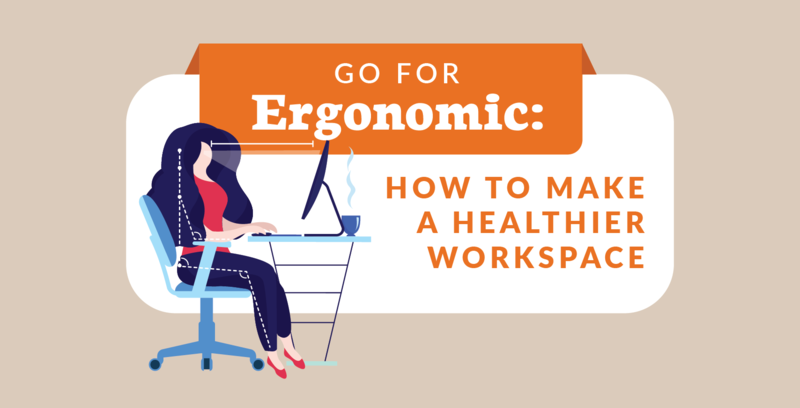 Ironically, these are also common causes of poor ergonomics.You need to consider ergonomics for your office spaces because, as studies have shown, it can boost your employees’ productivity and overall satisfaction. What Makes an Ergonomic Workspace? Much like a flexible workspace, importance is placed upon adjustable and movable essentials in an ergonomic working environment. Here are some of the most important pieces you need to have if you want an ergonomic office. Desk height depends on the user’s height and body type, so there is not one kind that would work for everyone. Employees should sit—or stand if they’re using a standing desk—with their arms at the sides and elbows on a 90-degree angle. If the elbows are not on a 90-degree angle, the desk or chair should be adjusted. If the counter is too low, place boards or blocks under the desk legs to raise it; but if it’s too high, the chair should be raised. Make sure that they have space under the desk for their lower limbs, so do not store anything underneath. A footrest can be used to support the feet if needed, or if there’s no footrest available, try using a small stool instead. If the desk has a hard edge, place paddings or use a wrist rest. An ergonomically positioned monitor is one that won’t require its user to turn their neck in any direction or squint their eyes just to view the display, whether they’re using a single monitor or multiple displays. The monitor must be placed in front of the user at about an arm’s length away, directly behind the keyboard. The top of the screen should be below eye level for just a little bit; lower it 1–2 inches more if the user wears eyeglasses. A light source should be on the side of the monitor. Tiltable monitors can help eliminate glare, but there are those that cannot be tilted, so it’s best to find the ideal lighting placement in this case. Place the keyboard and mouse as close together as possible, on the same surface, and within easy reach. If the table has a keyboard tray, make sure that the mouse is also on it. Users must position the keyboard in a way that the B key is directly in front of them. Keep the wrists straight when using the mouse or typing, with the upper arms close to the body and hands at the level or slightly below the elbows (90-degree angle). Keyboard shortcuts can help reduce mouse use. If possible, adjust its sensitivity, so there’s no need to put too much pressure when using it. Alternate mouse use from right to left or vice versa to allow the hand to rest. When the mouse is used at a wrong angle or the user does not follow the inline parallel rule for elbows and wrists, they lose neutral positioning which can cause excessive fatigue and, in the long run, injury. The computer may be the most important thing on the desk, but some employees also utilize other things for their tasks. Make sure that these things are easily reachable on the desk, and that the rest of their items goes inside a drawer. For those who often use the telephone, instead of cradling it between their head and neck, they can place the phone on speaker or use a headset. Here are some of the ways an ergonomic office can be advantageous to your company. Studies, time and again, have proven that poor ergonomics can affect your employees’ health. Aside from injuries that they can get due to tripping, falling, and other accidents, musculoskeletal disorders (MSDs) like Tendonitis and Carpal Tunnel Syndrome can also develop. MSDs occur due to repetitive motions, especially when the actions are done improperly or in an awkward posture. One of the simplest ways to prevent these is to use ergonomic, well-fitted, and adjustable furniture. You can also encourage your employees to move around from time to time, as this can improve circulation and help reduce the risk of lower back injuries. Injured or sick employees can significantly lower overall company productivity; naturally, this can lead to a decrease in profit. However, such effects also result in higher direct and indirect costs that can be attributed to poor ergonomics. Imagine paying higher workers compensation, health care, and insurance premiums just because your office chairs are too uncomfortable. On the flip side, ideal ergonomic solutions will enhance your employees’ productivity and quality of work. When they can properly focus on their job, they become more efficient. Awkward working positions especially when doing something repetitive may lead to stress, frustration, and fatigue. When completing a task becomes too physically taxing, they may not perform well. Less fatigue means fewer sick leaves, lower turnover, higher morale, and better employee involvement. These are all possible when you prioritize their health, wellness, and safety. With all these benefits combined, your company—and the employees—get to enjoy high ROI. When health, well-being, and safety are greatly considered, employees feel more refreshed and motivated. This would, of course, lead to higher efficiency, productivity, quality of work, and eventually, revenue. 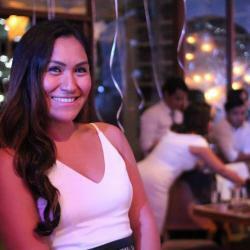 In addition, you would also have better chances of attracting and retaining the best talents. The implementation of ergonomic solutions can only work with strong leadership – when management takes the process seriously and everyone follows suit. One way to do it is to survey your staff to know if any of their tasks require them to spend long periods of time in the same position, or if there is high task repetition. Another way is to have someone observe the staff and see how they do their work. You could offer the best furniture for your staff, but if they don’t try to observe proper body positioning, then all will be for naught. Maintaining good posture means not slouching, sitting up with the back on a 100-degree angle, keeping the elbows close to the body and the wrists straight, and relaxing the shoulders and back to avoid tense muscles. Repetitive strain injuries can also result in MSDs. Changing tasks, even for a short time, can help reduce the potential damage on tissues under stress. When changing assignments is not possible, periodically changing positions can also be helpful. Even changing the sitting position from straight to standing, reclined, or declined, can help reduce repetitive movement. Once every hour, employees must stand up, move around, walk down the hall—anything to get them out of the chair. Taking breaks will help take the stress off the joints and muscles. Avoid eye fatigue and strain by looking away from the monitor and focusing on something else every 10–20 minutes. Look at something more than 20 feet away for about 5 minutes. Changing the focus to something in the distance will give the eyes time to readjust and the muscles to relax. Furniture is only a part of what constitutes ergonomics—the overall environment is also part of it, and this means lighting, temperature, humidity, and conveniences. Lighting should not cause glare on monitors, which entails using soft light systems since this is better for reading printed materials. Low temperatures should also be avoided to prevent MSDs. The importance of good office ergonomics cannot be stressed enough. Aside from keeping employees happy and healthy, a safe and healthy working environment is a productive one that is good for the business overall. However, keep in mind that furniture and environment aren’t the only ones that matter when it comes to ergonomics—every employee has the responsibility to make sure they’re using good ergonomics to their advantage.